Today Discovered presents the personal correspondence of Dr. Kellar Lench, on loan to us from the Gemma Museum of Interspecies Tolerance. Lent was a young scientist when he first discovered the Elysium System and the existence of the Tevarin in 2541. I can't take this anymore. 263 straight days of solitude in this "research" station with only the spectrum to keep me company. Heck, even the spectrum isn't always there for me. Sometimes the swirling red sands are so thick and vicious that they block out the signal. Or damage my transmitter. I've had to fix that thing so many times I consider myself an honorary electrical engineer by now. It's funny, dad. Even though I know you won't receive this message for days, I can already hear your response to what I'm sure you'll deem 'petty complaints.' Ever since I was a boy, you filled my head with stories of scientists willing to risk everything to make the universe a better place. "Great scientist sacrifice their life for their discoveries," you'd say. It sounded like dangerous and exciting proposition as a kid. Now I know it's anything but that. I still remember the look on your face when I told you about this research job. You were so proud. Your boy was being whisked away to live alone on a frontier world and do research for the good of Humanity. Confident that your son must have been hired for some extremely important work. Well, I regret to inform you that I wasn't. Turns out the New Horizons Research Institute is nothing more than a subsidiary of the Hathor Group. It took some digging to uncover the details, but when I found the proof, it all made sense. It explained why my only job was to deploy small research drones to search Yar's mountains for resources. There's nothing of scientific importance to be found around here. Only a hunt to help enrich a conglomerate that already owns its own system. I can't it take it anymore, dad. I can't keep sitting here, all alone, conducting 'scientific scans' and sweeping away this bloody sand. You raised me to pursue science, not to be a corporate shill for it. So I hope you understand why I'm abandoning my post. Please don't send your response here. I'll contact you again once I know where I'm going. I have to admit, it's been strange returning to a world where I'm not the only person in a 1,000 kilometer radius. Actually, it's why I came here first. I knew I could always escape to a park if I got overwhelmed by the craziness of the city. That and because I always knew you loved this planet. "If you don't see Fujin City before you die, then you're a fool," I remember you telling all your friends after returning from your conference here. Well, dad, you can rest easy because I've seen it. Though, considering what I just did, I don't think it completely absolves me from being a fool. Before I left Yar, I submitted a letter resignation to my superior at New Horizons. I didn't, however, sit around waiting for a response. I just left. Doubt that'll make her too happy, but I'm trying not to dwell on the consequences to come. I want to focus on what I can do to make a real difference in this world, like you taught me. At least my time on Yar gave me a crash course on research drones. I've gotten pretty good with them actually. Maybe I can figure out a new way to put them to use. Dad … you won't believe this. Not at first, I'm sure, but you will. The entire UPE's going to be talking about this. I discovered a new system! But that's not even the craziest part. One of its worlds is teeming with advanced life. There were lights everywhere, large structures that looked like temples and an impressive city built into a mountaintop. I so wanted to do deeper scans, but I didn't want to get too close. Figured it was best to maintain a safe distance for now. Okay, I have to admit, I did send a research drone down to the planet. Figured the more information I could bring back the better. Just to prove that I wasn't lying. I'd find all this hard to believe if I hadn't seen it myself. But, don't worry, I didn't do anything else. It should be government dignitaries and diplomats that make first contact. Not some guy who got lucky enough to find his way there. I wish I could tell you that I intended to make this discovery. After leaving Fujin City, I spent a few days drifting through space and experimenting with the settings on my research drones. Then this morning, one returned data I couldn't make heads or tails of, so I set out along its route. As I approached where the readings got interesting, I felt that familiar tug on the front of my ship. Right then, I knew I'd found a jump point. I had never been more excited and scared at the same time. I almost turned away from it. You know I'm not the best of pilots. I was worried I might not survive the jump. Then I heard your voice in the back of my head, "Great scientist sacrifice their life for their discoveries." Once that was echoing through my head, I couldn't let you down. Especially after walking away from my responsibilities on Yar. Eventually, I lost contact with the drone that I had sent down to the planet. My scans showed a few of their ships heading my way. So I figured I'd better get back to Centauri before they found me. Would hate to be the one that caused an incident. I was filling out the official UPE documentation right before I started this message but I had to stop and take a break. Everything suddenly became so overwhelming. There's been an entirely unknown species so close to us this entire time, and I was the one to find them. Part of me wants to keep them my own little secret, but I know that isn't fair. Like the Banu, we must open up our world to them. I'm sure there's a lot we can learn from each other. After I report my findings, I'll head home to share all the details with you. This species is nothing short of amazing! I can't wait until the day when we can meet one in person. T-shirts with that phrase have become ubiquitous throughout the Empire. Everyone knows it refers to the Space Whale, a tourist trap located in the Nemo System. Yet, only those who have visited the attraction know the truth: describing it as a Space Whale would be a stretch of the imagination. True, there is an oblong asteroid with one thick end tapering into a smaller one that orbits Ergo (Nemo III). There are even locals who will argue for hours about its strong resemblance to an Earth whale. Yet the main draw really seems to be the shops and attractions set up to entice the wayward tourist who happens to be lured here. Every Galactic Guide employee that has journeyed to the (in) famous landmark has returned to say basically the same thing, "Ergo, I got suckered." While the Space Whale may not live up to its billing, it is somehow fitting for the Nemo System. From Ergo, an ocean planet with vast oil resources but no (remaining) native life, to a system name that most assume is a reference to aquatics (but is actually an acronym for Norman, Ellis, Mau, and Ochoa; surnames of the founding partners of NemoCo, the company credited with discovering the system), the Nemo System is a place where things are not always what they seem. Even the system's discovery date has been called into question. Official records credit Dae-ho Ochoa, who was then a partner in NemoCo, with finding the system in 2364, but some believe he first visited the system in 2362, a discrepancy credited to corporate intrigue during Humanity's unregulated early terraforming era. The controversy centered on Ochoa who, in 2362, was a security contractor for the Tadmor Terraforming Concern in the Fora System. One day, co-workers lost contact with Ochoa while he was on a routine patrol. As a search party mobilized, Ochoa surfaced and then promptly quit without an explanation or logging his last day's flight path. That last detail went unnoticed by Tadmor management, who were overwhelmed by issues surrounding their botched terraforming of Fora III. Exactly what Ochoa did that day eventually led to a lawsuit calling into question Nemo's discovery date. In 2364, the nascent NemoCo purchased all Fora-based terraforming platforms from Tadmor at a steep discount. Tadmor was desperate for credits to address legal problems, and cut NemoCo a deal believing they would have to shoulder the cost of disassembling the massive platforms to get them to fit through the system's medium sized jump point. Yet, shortly after the purchase, NemoCo announced the discovery of an all-access jump from Fora to an entirely new system, which they promptly christened Nemo. An incredible stroke of luck, claimed NemoCo executives. For Tadmor, it was too big of a coincidence to ignore; particularly once they heard who found the new system. Dae-ho Ochoa's discovery of Nemo sent Tadmor digging through his employment file, which prompted a review of his sudden and strange departure from the company. Eventually, Tadmor filed a lawsuit against NemoCo alleging Ochoa had discovered the jump to Nemo the day he quit, and they were entitled to a stake of NemoCo's operations. Despite some circumstantial evidence, what Tadmor really needed was Ochoa's nav computer. However, Ochoa had sold his old Aurora and had no idea where it was. Tadmor investigators searched the known universe but were unable to find it. Lacking the evidence to prove their claim, Tadmor's lawsuit was thrown out of court and the company subsequently dissolved. Subsequently, the history of the Nemo System is entwined with NemoCo in more ways than name. Even the system's pivot from oil provider to tourist destination originated with NemoCo. They were the first to market the Space Whale to the universe, and convert Ergo's outdated oil rigs into tourist destinations — at a cost that eventually sank the company, but planted the seed for future entrepreneurs. Despite their incredible luck in Nemo, the company suffered from misguided leadership, and failing to establish a foothold anywhere else in the Empire, slowly faded away. While NemoCo is no more, their namesake system is thriving. 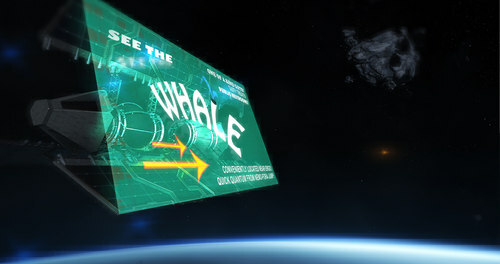 Much like the Space Whale, even though the system is not exactly what it seems, people continue to be intrigued by it. Don't forget to bring your sunscreen! Even cold, overcast days can take a toll on your skin with all the planet's water reflecting the sun's rays. The closest neighbor to the system's F-type, main sequence star is Nemo I. Today it is known as a protoplanet that lacks resources. Yet prospectors once thought it had potential, thanks to the MicroProbe. Selling itself as the next-gen in resource-detection technology, MicroProbe's initial bounteous scans of Nemo I turned out to be horribly inaccurate when double-checked. Luckily, Microprobe's shoddy technology was exposed before prospectors wasted time excavating it the barrens of Nemo I. Millennia of meteor strikes have sculpted a rugged surface on Nemo II. Besides creating a visually dynamic expanse, the meteors have also brought the planet precious ores and minerals. Today numerous mining operations have staked a claim on Nemo II to search for those valuable resources. Nemo III is a terraformed ocean world that has kept the Nemo System relevant to the Empire. NemoCo quickly established itself on Ergo when scans revealed significant oil reserves under the ocean. Once terraforming was completed, massive oil rigs, many made from the decommissioned terraforming platforms, were built to extract the underwater resources. As pockets of oil were depleted, the rigs were converted into permanently habitable platforms with shops, restaurants and civil services to accommodate the high number of workers who wished to stay on planet after their contracts ended. In the late 27th century, a study conducted by the University of Mentor showed that on average Ergo's residents lived longer than residents of other worlds, and used words like "peaceful" and "tranquil" to describe the planet. This general perception of Nemo's idyllic and relaxing lifestyle spread throughout the Empire and led to a booming tourism industry. Over the centuries, ambitious developers have even built luxury platforms geared specifically for tourists. Of course, the biggest mystery is how vast quantities of oil even got under Ergo's ocean. No native life existed on Ergo when Humanity arrived, and researchers are still searching for any fossil evidence of what life once existed there. While exactly what happened is unknown, the most widely accepted explanation is that millennia ago an extinction level event eradicated all native life. These unknown, and long gone, organic species are who we have to thank for Ergo's oil reserves. To this day, the misperception that Ergo's ocean has life still exists, probably amplified by its association with the Space Whale. In fact, Ergo's tourism ads and brochures go to great lengths to dispel this notion; even specifically telling tourists NOT to bring fishing gear on their vacation and highlighting how much safer it is swimming in water void of anything that can eat you. "I can't exactly put my finger on it, but something about the sea stretching to the horizon in all directions was calming for me. After I finished my contract on the rig, I immediately told my boss I wanted to stay. Made no difference if she had made me a floorhand. I would've taken any assignment she had. Of course, I didn't tell her that second part." "On the day in question, Mr. Ochoa was assigned to patrol the section that the Fora-Nemo jump point now occupies. Following his mysterious, and still unexplained disappearance, Ochoa's first contact with members of the search party desperately trying to find him was traced to a mere 75,000 kilometers away from the jump."